When we brought our son from the hospital, we put him to listen to music right away because of our pediatrician's advise. He listens to music every day since then. We started Tommy's first collection of Musical CDs, which includes: American Indian, Celtic, English and Spanish nursery rhymes, contemporary English and Spanish music, Instrumental music, Christmas music, Opera and all the music that daddy's likes, too. Jazz is the next music gender we will try. To afford an extensive musical collection, we don't spend money. The dollar store close to my house has a good selections of CDs. We also listen the online radio www.pandora.com because we can chose the music gender we like. Musical instruments are good for helping kids to improve fine motor skills and hand-eye coordination. 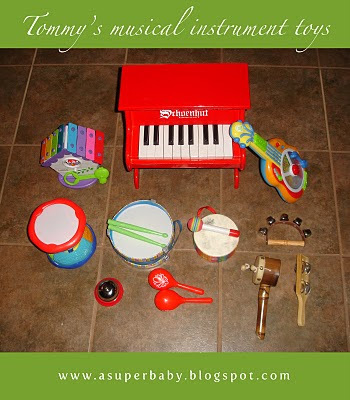 Because of Tommy's Hypotonia (decrease muscle tone), we have a selection of musical instruments to help him to strength the little muscles of his hands. My mom gave the toy piano to Tommy for his first Christmas because her dream is that Tommy learns to play the piano. What I like of this piano is that it is is a real piano adapted for babies. Learning to play the piano, and the study of music in general, engages both hemispheres of the brain. The benefits of this learned skill carry on through adulthood. Music education involves both art and math. The piano is an ideal first musical instrument for kids to learn because the keyboard is easier to master than other instruments. The article "Music and Movement - Instrumental in Language Development" by Maryann Harman, M. A. is the best explanation I have found about how the music affects or stimulates the brain. According to this article "Each component of music affects a different part of the brain, e.g. a familiar song activates the left frontal lobe, timbre the right frontal lobe, and pitch the left posterior. One side of the brain processes the word while the other processes the music – activating the whole brain ensures better retention. Short-term memory has the ability to hold only seven bits of information. If bits of information are bonded together, as in a song, it can be processed as one piece. By condensing the information, the brain is able to receive and process more." Click here to read the complete article. Tommy loves music and it is amazing to watch him playing his musical instrument toys because he changes the rhythm and the tunes. I think he does it because of cause and effect as part of his learning experience. He maybe think: If I play the piano, What would it happen if I use all my fingers to touch different keys? If I move the maracas up and down, what happens? How would it sound? Enjoy the video of Tommy playing his instrument toys. she thouhgt it would be difficult for him, but he knew what to do. helps him to strength his index fingers (He was younger in this video). baby In this video, he was about 13 month. He is a big boy now. You may be unable to see the videos if you received this post in your email. Please click on www.asuperbaby.blogspot.com to see the videos. He is quite an accomplished musician and he has Down syndrome. LOVE the Tommy videos and the article! i like the desk bell idea. a great way to get an index finger to work out!